• Luxury 2 bedroom, 3 bathroom Resort Home with a spacious, grass backyard and lovely trees adjacent to tranquil Peterson Brook. Ideal for relaxing, sunbathing, entertaining, and being one with nature. Seasonal flowers grace the front entrance. • Two cozy fireplaces: one in living room and a second fireplace in master bedroom. • Wireless and wired high speed Internet at no charge. • .Features a new, well-appointed kitchen with new appliances, quartz counters, maple hardwood cabinets and ceramic tile floors. The breakfast table has seating for 4 or 5. • Pass-through open, quartz counter between kitchen and dining room. Dining room is separate room but openly integrates with both living room and kitchen. Seating for 6 to 8. 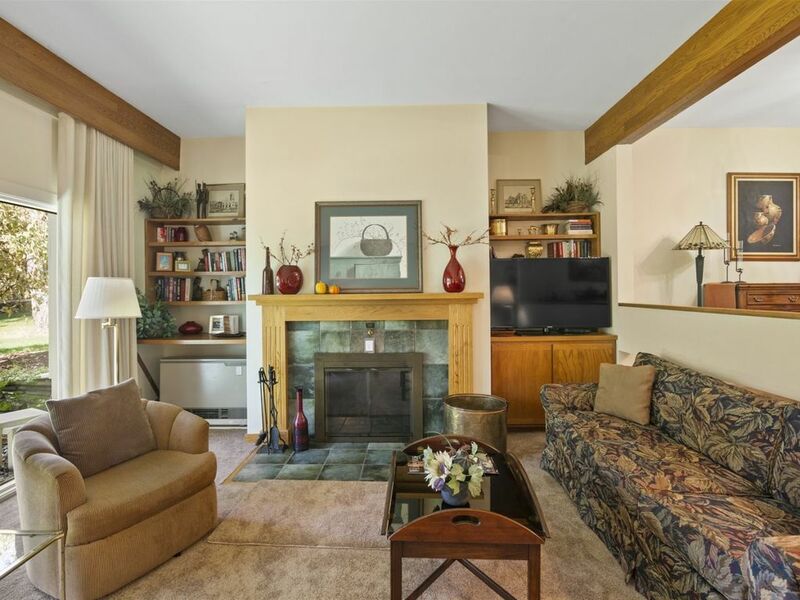 • The living room has a wood burning fireplace, two large comfortable sofas, two swivel chairs, leather chair with ottoman, 42” flat screen TV, DVD player, a wall of windows, and sliding glass door to backyard. • The home has a unique floor plan with separate kitchen, dining room, and living room, yet all three rooms are open to each other, providing a very warm and comfortable feeling of space. • Tastefully decorated with art and evoking a warm, comfortable setting. • Large windows in living room provide bountiful, natural light and views of nature. • Large Master bedroom suite (cathedral ceiling) with a king size bed, Master bath with Jacuzzi, wood burning fireplace, sitting/reading area, balcony, TV, DVD player, telephone, and alarm clock radio. • Beddings in this Resort Home have been upgraded and include duvet, for seasonal comfort. • The second bedroom has two twin beds, a separate table with chairs ideal for games or computer work, its own closet area and private bathroom with bathtub/shower, a flat screen 32” TV, telephone and an alarm clock AM/FM radio. • There are 3 full bathrooms, 2 with showers and 1 with shower and bathtub. The Master bath also features a large Jacuzzi tub. • Resort Home is located just a 2 minute walk to the Spa complex, which includes both year round indoor and outdoor pools( heated in winter) and hot tubs, as well as a full service Spa and fitness center. Two outdoor Resort tennis courts are adjacent to home. • Conveniently located about midway on the Mountain Road, about a 5 minute ride north to either Mts. Mansfield and Spruce, or 5 minutes south to the Village of Stowe. This beautiful resort is located in the Green Mountains, just one and a half miles from Stowe Mountain Resort. Skiing, snowboarding, snowshoeing, sleigh rides and Nordic skiing await you in the winter. Golf, hiking, biking, mountain biking, river tubing, outdoor concerts and swimming await you in the summer. Our two bedroom condo is located just a short stroll from the spa complex which includes both year round indoor and outdoor pools and hot tubs as well as a full service spa and fitness center. Topnotch`s Tennis Center was recently rated #1 in the Northeast and #6 in the world by Tennis Magazine. The quaint village of Stowe is bustling with activity throughout the year and offers a plethora of restaurants and shops. The above listed services & amenities are not included in the rental rates of this private home. Topnotch charges all Resort Homes a daily access fee of $30 per bedroom to use indoor and outdoor pools, hot tubs, sauna, steam room, fitness center and private ski shuttle. This fee may be added to your reservation, or you may pay at the Topnotch Spa desk each day you choose to use the facilities. The Resort Access fee covers up to 6 people staying in the Resort Home. State of VT Rooms tax MRT-10045784-001. Our guests enjoy complimentary use of the outdoor heated pools and hot tub. Topnotch charges all Resort Homes a daily access fee of $30 per bedroom to use the indoor pool, hot tub, sauna, steam room, fitness center and private ski shuttle. If you do not wish to use these amenities every day, you may pay at the Topnotch Spa desk each day you choose to use the facilities. The Resort Access fee covers up to 6 people staying in the Resort Home. Very clean & well laid out 2 bedroom 3 full bath condo. The indoor & outdoor pool and outdoor hot tubs at the Topnotch Spa are walking distance from the condo which is great for the kids. Flannel restaurant at the Topnotch Hotel is also walking distance. You have to drive however to catch the shuttle to Stowe because it’s down a big hill so that was a bit of a disappointment. The staff at Stowe Resort Homes is very helpful. We would stay there again. What a wonderful place.. First of all, there is no other place to stay except Topnotch. This townhouse is perfect.. Spacious, great floor plan. We loved that it has an upstairs and downstairs as we have young children, and it was nice to put them to sleep and still enjoy! The location of the house is perfect. Our kids would just go out the sliding doors and play out in the backyard. So pretty.. There are chairs and table to sit out and have glass of wine! The best part, was that we just walked right over to the tennis courts that were right outside our door. And the pool was so close we walked to it many times a day!! We were reluctant to even right a review because we want the place all to ourselves!!! =) But thought we should share. Missy is great to work with!! thank you to the owners for allowing my family to create some amazing memories. Look forward to coming again,, Hopefully more times this summer! !